North Carolina puts on one of the most dazzling fall color displays in the country. Whether you are chasing the region’s spectacular waterfalls or taking a long drive up the Blue Ridge Parkway, our region’s endless beauty is undeniable from every view. Below you will find some of our favorite ways to explore North Carolina in the autumn, but if you are looking for more great ways to celebrate the season, download our free Chimney Rock Vacation Guide. It is full of recommendations on apple orchards, fall festivals, outdoor recreation, and more. The state and national parks in North Carolina are premier leaf-peeping destinations. Some of our favorite parks to explore in the autumn include Chimney Rock State Park, Pisgah National Forest, and Dupont State Forest. All three of these beautiful parks encompass endless hiking and walking trails, breathtaking wildlife, and spectacular waterfalls. For those who are unable to hike, you can still enjoy 75-mile panoramic views of Lake Lure and the Blue Ridge Foothills at Chimney Rock State Park; an elevator is available to lift your way to the top. With so much beauty and things to do at these parks, you aren’t going to want to leave for lunch, so pack a picnic basket and make a day of your trip! If you don’t have the time or energy for a hike, we’ve got you covered. Hop in the car and drive up the Blue Ridge Parkway to find some of the best fall colors in North Carolina. It is one of the longest and most scenic roads in America. The Blue Ridge Parkway is a 469-mile route that travels through mountains that are blanketed with trees. In the fall, the trees transform with brilliant shades of red, gold, and orange leaves. You’ll find countless points of interest along the way as well as plenty of places to stretch your legs. Plus, many rural areas add colorful barn quilts to buildings, which are fun to spot on your road trip. Remember: it’s all about the journey! Go slow, stop frequently, and enjoy. With over 8,000 acres of grand estate, the Biltmore Estate is the perfect place to enjoy North Carolina’s fall colors, whether there is rain or shine. From majestic views of the Blue Ridge mountains from the top of the Esplanade to brilliant gardens blanketed with orange mums, there are so many great places to enjoy autumn at The Biltmore Estate. If you want to make the most of your trip, we recommend scheduling an estate tour! During the autumn, the weather in Western North Carolina fluctuates between chilly mornings and warm afternoons. You will also notice differences in temperature at varying elevations. We recommend wearing layers! 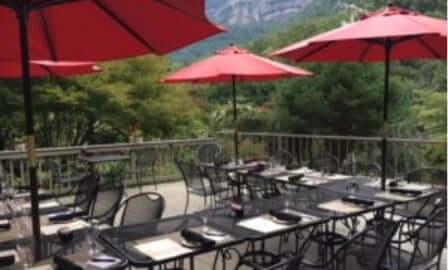 If you are planning a trip to Western North Carolina, take advantage of everything that the Esmeralda Inn & Restaurant offers! 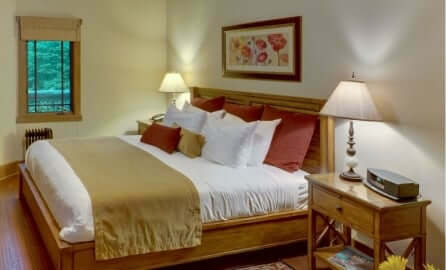 Some of our most popular packages include the Hickory Nut Gorge Package and the Biltmore Estate Package. If you are looking for more unique places to enjoy North Carolina’s fall colors, download our free vacation guide! It is full of great recommendations on best-kept secrets, like the Lake Lure Flowering Bridge, apple orchards, and more. 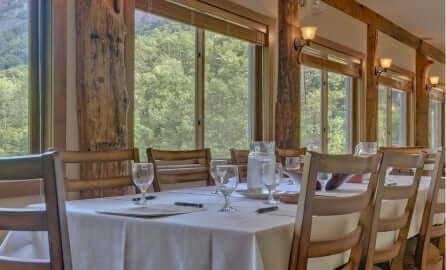 Overlooking the crystal-clear rapids of the Rocky Broad River and Hickory Nut Gorge, The Esmeralda Inn & Restaurant is the perfect place to admire Western North Carolina’s brilliant fall colors! When you book a stay in any of our classic log cabins, like the Chimney Rock River Cabin, you can always look forward to the best amenities, luxurious packages, and top-notch service. 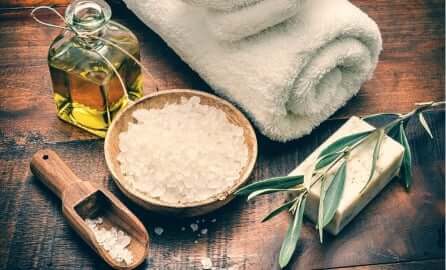 Complimentary breakfast at the Esmeralda Restaurant, access to our outdoor whirlpool spa, and on-site spa services are just a few things to enjoy during your vacation! If you are ready to plan your fall getaway, check our availability and book your stay. We can’t wait to host you at The Esmeralda Inn & Restaurant! If you are looking for another fun way to celebrate the changing fall colors in North Carolina, read our blog on the North Carolina Apple Festival!